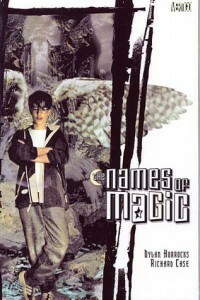 The Names of Magic, Dylan Horrocks (writer) and Richard Case (illustrator), Vertigo, 2002, ISBN 9781563898884, 124pp. When I was younger, I had fantasies of being a great wizard, of being able to conjure things from thin air with the power of words and gestures. I doubt I was alone, as magicians are a special favorite of children, who aren’t so skeptical to search for the wires and trick pockets. The Vertigo series, “The Books of Magic,” taps directly into those fantasies in its depiction of young Timothy Hunter, who can not only perform feats of magic, but is destined to be the greatest wizard of all time. That is, if he can survive adolescence. In this he, of course, resembles that other famous fledgling wizard, and the stories have some of the same moral lessons along with their sympathetic protagonists. Harry Potter is written for young adults, and while Tim Hunter’s tale is part of the Vertigo line, suppossedly a comic (or today’s preffered term, the graphic novel) meant for adults, in this particular case it rarely contains anything more shocking than prime time TV. The latest installment of Tim’s story, The Names of Magic, doesn’t really add anything to the drama of his story, but it does fill in some of the pieces of his mystery by answering the question of his parentage. It’s a well done adventure, presented nicely, and a welcome addition to the series, but I do hope that there’s more to “The Books of Magic” than this as several threads from the main tale remained unfulfilled, especially the powerful love story between Tim and Molly.